Greetings again from the darkness. When a director’s filmography includes “big” action movies like Edge of Tomorrow, Mr. & Mrs. Smith, and The Bourne Identity (the original), the last thing we expect is a stripped-down war movie whose camera focuses on a single character for most of the run time. Director Doug Liman certainly understands how to use the camera in creating tension and stress, yet while he and writer Dwain Worrell seem so intent on proving the confusion and futility of war, they seem to forget that a thriller needs either a hero to cheer or a villain to jeer. It’s late 2007, and the war is winding down as rebuilding efforts are underway. 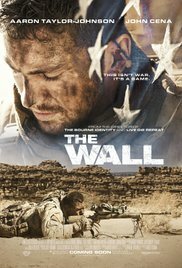 Hulking Staff Sergeant Matthews (John Cena) and his fellow soldier Isaac (Aaron Taylor-Johnson) have been perched and camouflaged on the side a hill for more than 20 hours as they carry out reconnaissance on the site of an under-construction oil pipeline. All they have seen is the remains of a massacre – 8 bodies with no signs of life. Peering through his malfunctioning scope that once belonged to a now-dead friend, Isaac (known as “Ize” – get it?) and his training thinks something doesn’t seem right. When Matthews deems the site safe, he heads down to check it out. Of course, all heck breaks out and soon enough, an injured Isaac takes shelter behind a teetering stone wall. It turns out a sniper, more patient than the American soldiers, had been biding time for the moment. The first eight bodies are construction contractors and a security detail … none of which matters to the sniper. The hook here is that the sniper hacks into Isaac’s radio and seemingly wants to chat it up, rather than finish him off. We never see the sniper, and neither do Matthews or Isaac … but we do hear him plenty. Laith Nakli voices Juba – known to American soldiers as the Angel of Death, responsible for dozens of US casualties. The film spirals into a psychological game of chess – or, more fittingly, the torture of Isaac. This isn’t the war we’ve come to expect in movies. Isaac’s situation seems hopeless, and banter with the man responsible never strikes him as a worthwhile pursuit. The biggest issue here is that Juba seems the most interesting character, and not only are we never provided a way to connect with/hate him, we don’t even get enough backstory to bond with Isaac. Plenty of obstacles are thrown at Isaac: blowing sand, lack of drinking water, skittles for sustenance, blazing sun/heat, radio issues, and a brutally painful knee wound courtesy of Juba. The success of the movie depends on two things: Aaron Taylor-Johnson selling us on Isaac’s predicament, and the radio dialogue between he and Juba. The former is fine, but the latter falls short. Better sniper movies include American Sniper and Enemy at the Gates, while more effective (mostly) one-character thrillers include Locke, Buried, and 127 Hours. The film makes excellent use of sound, but the little jabs at American ideals grows old quickly (such as asking who is the real terrorist). A different approach to a familiar topic deserves a chance, but while Juba only misses on purpose, the efforts of Mr. Liman and Mr. Worrell miss the mark by not engaging the viewer with the character(s). This entry was posted on Thursday, May 11th, 2017 at 11:37 pm and is filed under Thriller, War. You can follow any responses to this entry through the RSS 2.0 feed. You can leave a response, or trackback from your own site.